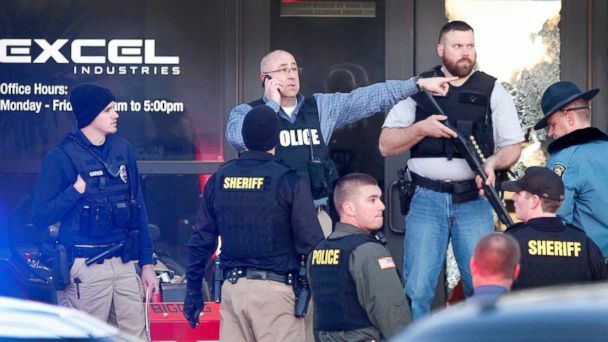 Three people were killed and 14 wounded in an horrific shooting at a Kansas workplace and two other locations Thursday evening, authorities said. The shooter, an employee at Excel Industries -- one of the scenes -- was killed by police, Harvey County Sheriff T. Walton said in a press conference Thursday. The gunman was identified as 38-year-old Newton resident Cedric Larry Ford, two law enforcement sources familiar with the investigation told ABC News. Police said the shooter fired from his car and shot people at two nearby locations before unleashing a hail of bullets in the factory, hitting 15 people, and killing three of them. "I'm really saddened by this horrific event," said Excel CEO Paul Mullet. "My heart goes out to all of the employees, all of their families." He was later shot to death by cops in a gun battle when a heroic officer shot him despite taking fire. At least 14 people were hospitalized -- six at Via Christi Hospital, four at Wesley Hospital and four at Newton Medical Center, Walton said. Newton Medical Center was on lockdown due to an ongoing crime scene nearby that was related to the shooting. Five victims are in critical condition, one person in undergoing surgery and eight are in stable condition, the sheriff said. Walton said the carnage began about 5 p.m. when the gunman opened fire from his vehicle in a location nearby Excel. He hit two vehicles, injuring one person. After that, he went to another location near Highway 81, where he shot a person in the leg, police said. After that he drove to the plant, which manufactures heavy-duty lawn care equipment, where he opened fire before being killed by police. Police said he was using a long gun that uses .223 caliber bullets. It was not exactly clear what type. Police said he was also believed to be carrying a pistol. Police wanted to search the shooter's home in Newton, but a resident inside refused to leave, Walton said. Investigators are unclear on what the shooter's motive was, but Walton said it was "not terrorism." But he did say there were "some things that triggered this particular individual." There was only one shooter involved, Walton said. A witness who works in the welding department said the shooter was firing off rounds as he chased Excel Industries employees who were screaming, "Fire! Fire!" "I thought it was a fire, explosions," Marty Pierce told KAKE. "I didn't know someone was shooting." Pierce said a coworker who looked in a hallway to investigate was shot in the leg. The 15-20 people who were in his department escaped through a side door, he said. Nearby Hesston college was put on lockdown during the shooting, the school said on its website. There were about 375 students and faculty on campus at the time of the lockdown, KAKE reported. The lockdown was later lifted. The Newton Police Department also said it entered Ford's Newton home after receiving conflicting reports that someone was inside. "We had to act as if there were other victims or someone else inside who wanted to do harm," said Lt. Brian Hall of the Newton Police Department. "We tried to make contact for hours and eventually had to force entry into the home. There was no one inside." Lt. Hall did not elaborate on what was found in the home. Kansas Gov. Sam Brownback and Wichita police offered condolences to the victims on Twitter.